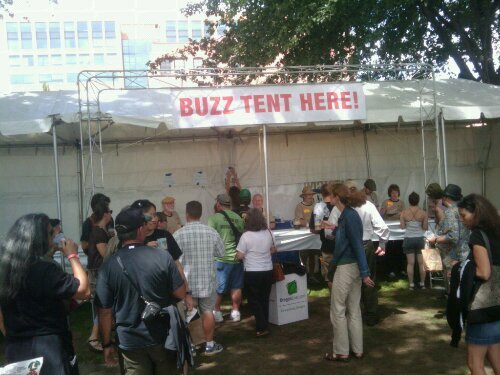 Standing by the Buzz Tent I’ve heard a lot of “What is the buzz tent?” So here you go. The Buzz Tent features an assortment of beer outside of the standard taps at OBF. The beers are generally a little more unique, smaller batch offerings such as the Quad belgian from Deschutes, the barleywine from Maui Brewing and the Pinot barrel aged strong ale from Oakshire. Of course these beers don’t come cheap, they are 2 tokens instead of 1 for a taste. Nevertheless, given the unique selection offered at the Buzz Tent, I recommend you at least sample a few from here. Posted on July 22, 2010 Author BruceCategories LIVE! Next Next post: Hair of the dog brewing opening soon!